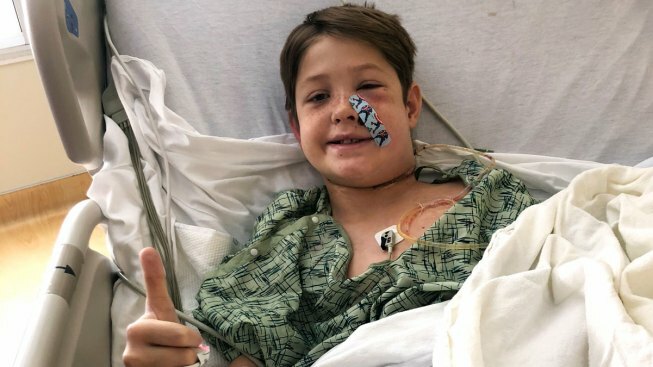 In this Monday, Sept. 10, 2018 photo provided by Shannon Miller, his son Xavier Cunningham, of Harrisonville, Mo., gives a thumbs up while recovering at the University of Kansas Hospital in Kansas City, Kan., after surgery to remove a meat skewer that penetrated his skull from his face to the back of his head. A 10-year-old Missouri boy is recovering after he was attacked by insects and tumbled from a tree, landing on a meat skewer that penetrated his skull from his face to the back of his head. But miraculously, that's where Xavier Cunningham's bad luck ended. The skewer had completely missed Xavier's eye, brain, spinal cord and major blood vessels, The Kansas City Star reports. Xavier's harrowing experience began Saturday afternoon when yellow jackets attacked him in a tree house at his home in Harrisonville, about 35 miles (56 kilometers) south of Kansas City. He fell to the ground and started to scream. His mother, Gabrielle Miller, ran to help him. His skull was pierced from front-to-back with half a foot of skewer still sticking out of his face. Miller tried to reassure her son, who told her "I'm dying, Mom" as they rushed to the hospital. He eventually was transferred to the University of Kansas Hospital, where endovascular neurosurgery director Koji Ebersole evaluated the wound. An x-ray provided by the Medical News Network shows a meat skewer impaled in Xavier Cunningham's skull after an accident at his home Saturday, Sept. 8, 2018, in Harrisonville, Missouri. "You couldn't draw it up any better," Ebersole said. "It was one in a million for it to pass 5 or 6 inches through the front of the face to the back and not have hit these things." There was no active bleeding, allowing the hospital time to get personnel in place for a removal surgery on Sunday morning that was complicated by the fact that the skewer wasn't round. Because it was square, with sharp edges, it would have to come out perfectly straight. Twisting it could cause additional severe injury. "Miraculous" would be an appropriate word to describe what happened, Ebersole said.